I take trapeze classes in the Navy Yard area of SE DC near the baseball stadium. Recently, some friends joined me for a class, so, naturally, we wanted to grab a drink afterwards. In fact, we had a pretty big party of like eight people. I'd never been to Bluejacket down the street so we headed in that direction. Bluejacket is a huge bar with outside seating. They serve quite a bit of food as well. We were lucky to arrive right when a large party was leaving their outdoor spot and we snagged it quickly. 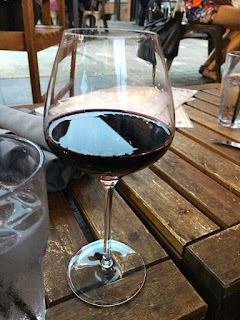 I had just expected to have a glass of wine, but when the server offered a number of vegan options to me, I thought, "why not?" I started with the Seasonal Board, which had northern neck asparagus, tomatoes, spring onion, tomato confit, marinated wax beans and romesco sauce. The manager there was so helpful as he had a list of ingredients for like every item on the menu and he confirmed that the romesco was vegan. It was great! 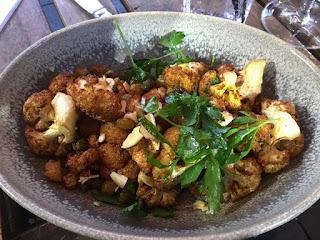 I also tried the Crispy Cauliflower, which turned out to be kind of soft cauliflower, but had great flavor. It was tossed with toasted almonds, fried capers, and golden raisins; hold the yogurt. So, for a quick bar meal, it was great. The dishes were $7-$8 and the wine was very nice. The servers were attentive and helpful and knew or could find out what was vegan. Great experience -- I'll be back again.